In the first two Avengers movies, the powered-up ensemble comprised little more than a handful of characters, and they spent most of the plot fighting at each other’s side. Over the last few years, though, the Marvel Cinematic Universe has experienced a superheroic population boom, and that presented a logistical challenge for Avengers: Infinity War screenwriters Christopher Markus and Stephen McFeely. “We didn’t want a movie full of 25 people going from room to room,” said McFeely. “We wanted threads that we could weave together and break apart.” That meant Markus and McFeely spent a lot of time brainstorming which character groupings would both service the plot and produce the sparkiest chemistry. Below, they tell Vulture how they decided to split up the Avengers. 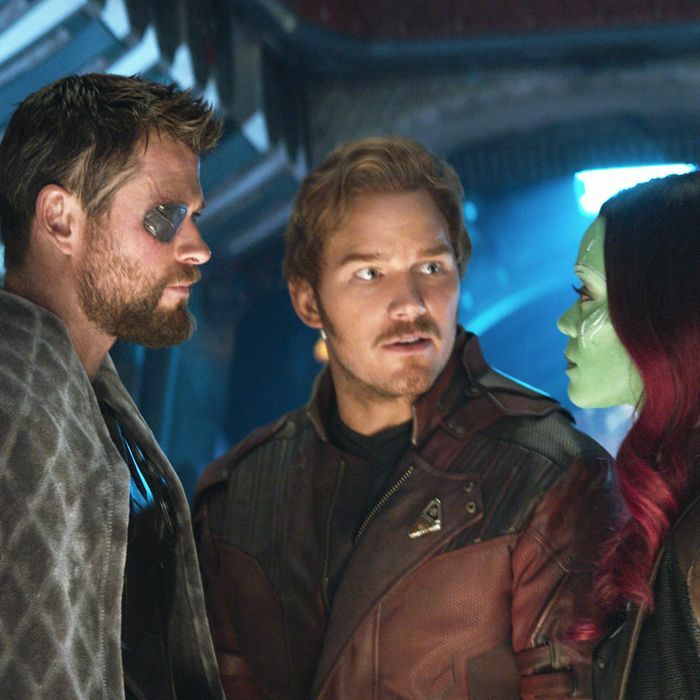 After he’s dealt a big blow by Thanos in the first scene of Infinity War, a space-stranded Thor (Chris Hemsworth) encounters the Guardians of the Galaxy, and that character collision inspired some of the biggest rewrites from Markus and McFeely. “We changed a few scenes early on because Hemsworth had just done Thor: Ragnarok and was concerned,” said McFeely. “He was like, ‘Listen, guys, I’ve been in Australia and we’re doing crazy stuff!’” Though Thor was originally meant to be the straight man for Marvel’s most comedic team of characters, Thor: Ragnarok director Taika Waititi had just showcased a jokier side of the muscular god that Hemsworth was keen to keep, so the writers flew Waititi out for two days to pick his brain, then revamped Thor and his Infinity War arc to accommodate that funnier sensibility. Figuring out a compelling arc for Thanos (Josh Brolin) posed the movie’s greatest problem: The filmmakers knew they wanted to ditch the comic-book plotline where Thanos woos a female manifestation of death, but that left few scene partners for the villain, since his minions spend most of the movie retrieving Infinity Stones elsewhere. The solution that Markus and McFeely came upon was to make his primary foil Gamora (Zoe Saldana), the adopted daughter who rebelled against Thanos in the first Guardians of the Galaxy movie but had not yet shared any scenes with him.